We recently moved into a new rental house and we are loving the process of decorating it. We have some new living room basics such as our new couch and new rug, but the accessories are really what will set this room apart. It's a pretty blank slate right now with every piece falling in a neutral color palette. And while I love the simplicity and freshness of neutral colored rooms, I think my living room is calling for a little bit of color. It's amazing how some art, throw pillows, and window treatments can transform a room, even more than a piece of furniture. After scouring my favorite design blogs & Pinterest favorites, I chose Jacquelyn Clark of Lark and Linen living room for my inspiration. 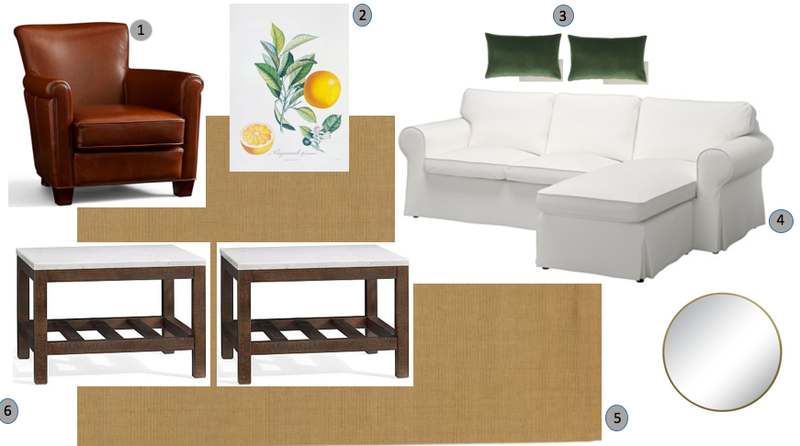 It is fresh, light, simple, cozy, sophisticated, and attainable- everything that I want in a living room! Take a look through her design blog and be prepared to be inspired by her interior design style! 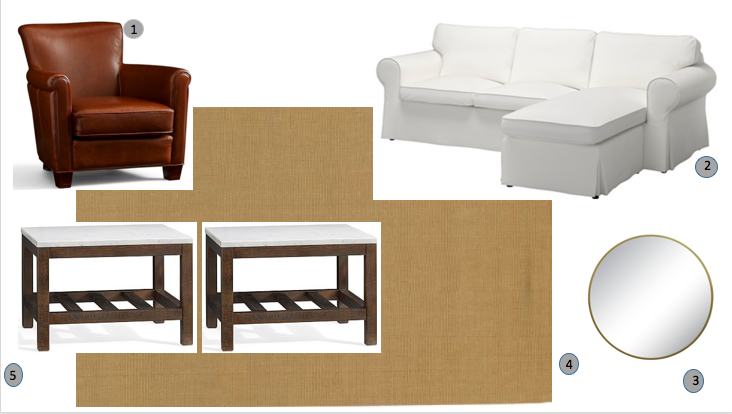 Staples - These pieces are what we already have and are going to incorporate into the living room. They are basically a blank canvas, while still a little interesting with different textures that can be built upon. 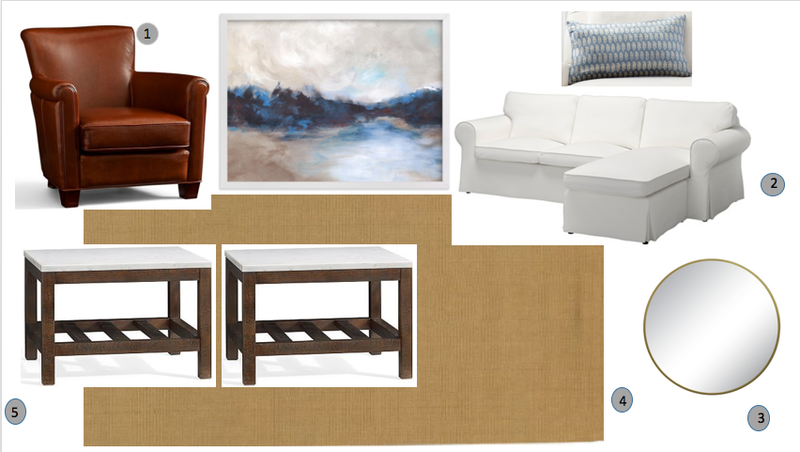 I used powerpoint slides to add in accessories to be able to see how the colors and textures would play off each other in the living room. 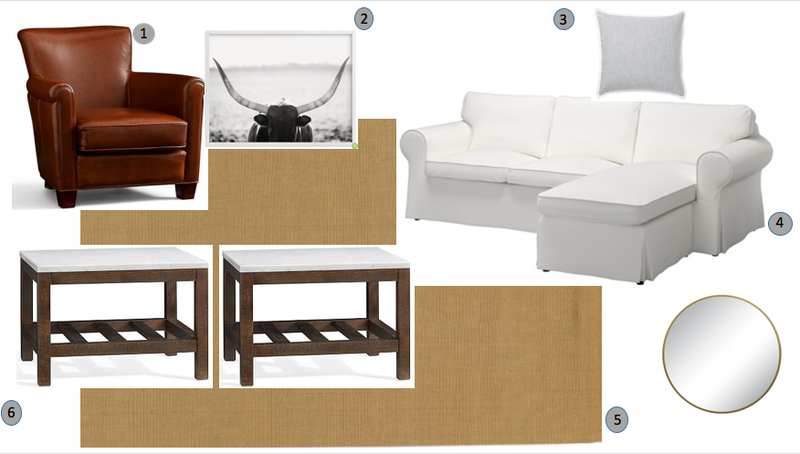 Our furniture staples already include leather, jute, marble, wood, and gold. I love velvet, especially in pillows and mixed with a nice oil painting would really make my other wise pretty basic pieces of furniture, more cohesive and cozy. After choosing the pillows and art, I will move on to purchasing window treatments and a couple of additional storage pieces. Any ideas or suggestions? I completely torn!